“In these pages, we travel the country with Debra Landwehr Engle as she visits 20 gardens and gardeners from California to Maine and Minnesota to Arkansas, showing us that grassroots campaigns actually can and do involve roots—and seeds and garden trowels. That any person with a steadfast resolve and an open patch of dirt can help bridge the gap between multinational refugees. That lush vegetation and running water and cool stones can help spark the fading memories of our elderly. And that our children can learn about where food comes from, labyrinths, wetlands systems, and healing from grief and loss just by digging in the earth with a caring adult hand to guide them. 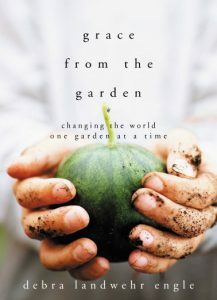 “As the stories in this remarkable collection demonstrate, the simplest act of gardening can produce significant changes in the lives of people we might never even meet. Consider the man who sends seedlings and greenhouses halfway around the world to feed hospital patients, or the immigrant woman who began selling her own flowers as a way to raise money for overseas charities, or the couple who offers their land as a midday retreat for the residents of nearby nursing homes.